Grace Glergue Harrison. 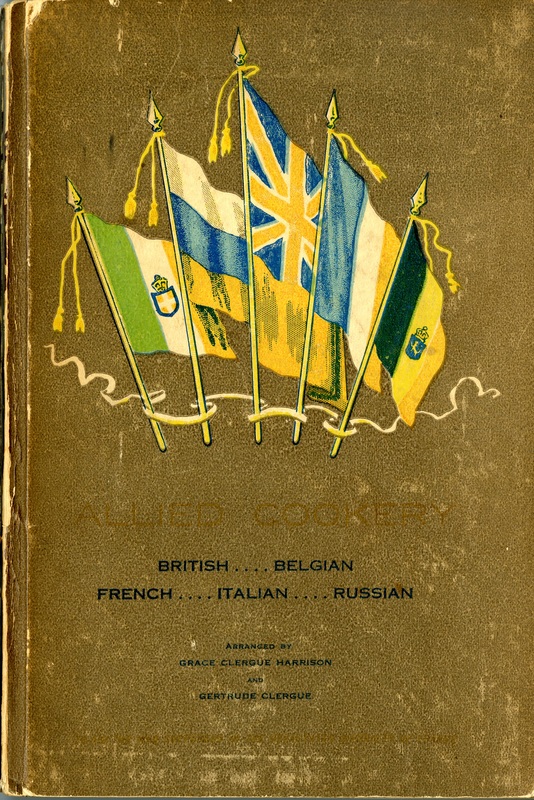 Allied Cookery: British, French, Italian, Belgian, Russian. New York and London: G.P. Putnam’s Sons, 1916. A century ago, the Great War was causing massive casualties and destruction in France. Allied Cookery, the product of an international collaboration, was written as a fundraiser. The proceeds were distributed by Le Secours National, the French organization created immediately after war was declared in 1914. The brainchild of banker and arts patron Albert Kahn, Le Secours raised funds to provide food and warm clothing to French soldiers and their families and to civilians in the country’s devastated regions. The cookbook’s introduction explains that any money raised will go to those areas that had been invaded by the Germans and subsequently retaken by the Allied forces. The impact of the damage was all the more horrific because these were France’s most fertile agricultural regions. With the buildings destroyed and the farm implements, livestock, and food stores seized, the surviving farmers could not produce food. With armies to supply, shortages were a real danger. Allied propaganda posters encouraged citizens to grow vegetable gardens and to restrict their consumption of wheat, meat, sugar, fats, and fuel. (French propaganda posters included the wine and tobacco products so badly needed by the military!) Fittingly, the recipes in this cookbook emphasize vegetables, beans, and soups. The section on meats includes many dishes using the less choice bits: tripe, kidneys, sheep’s head and the like. 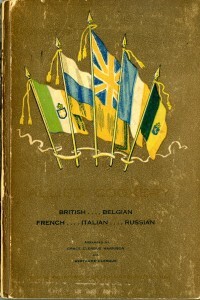 In addition to the countries listed in the title, Allied Cookery includes recipes from Commonwealth countries and Eastern Europe. Hence, there is a whole section on curries and dishes such as Pilau (pilaf) and Serbian Cake. 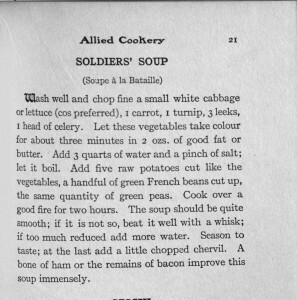 I decided to try the Soldiers’ Soup (Soupe à la Battaille); it seemed altogether fitting when highlighting a World War I cookbook and also potentially tasty. The ingredients were, for the most part, easily obtained at my usual supermarket. I was unable to find chervil for the garnish, and so simply left it out. The note at the bottom suggests that “a bone of ham or the remains of bacon improve this soup immensely.” I therefore purchased a bone of ham from our local HoneyBaked Ham. The instructions were extremely simple to follow and it is easy to imagine an army cook preparing the soup over an open fire using vegetables that had been requisitioned from nearby farms. 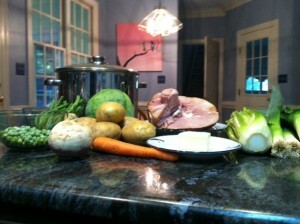 There was a great deal of washing, peeling, and chopping and I needed to use my largest cooking pot. After everything was added, I left the soup to simmer, with only occasional stirring, for two hours. I pulled out the ham bone and skimmed the fat. The recipe says that the mixture should be quite smooth at that point, and if it is not, the cook should “beat it well with a whisk.” Mine was not smooth, so I cheated a bit and used my 21st century immersion blender. The result was a beautiful jade green silky concoction. The flavor was absolutely delightful—a fresh vegetable taste with a little smoky depth from the ham and a creaminess from the potatoes. I shredded the ham and served it on the side, but the soup was delicious without it. My husband ate three full bowls. I would rate this soup a five out of five. Without the ham, it would be a perfect vegan dish. It makes so much that I refrigerated enough for another two or three meals and froze several large containers for later consumption. 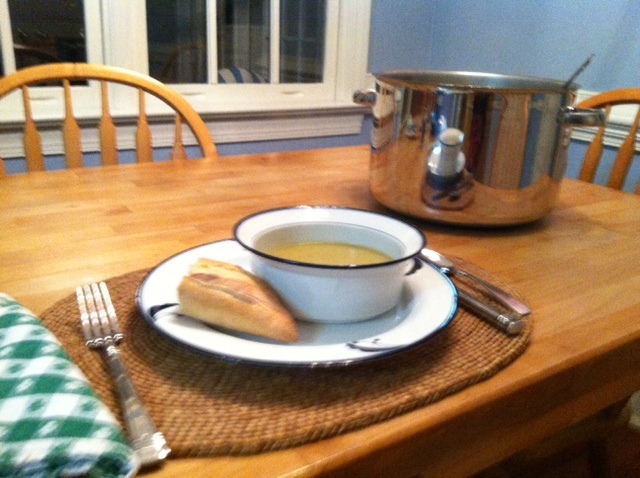 Civilians were called upon to sacrifice for the war effort, but preparing and eating this soup was no sacrifice whatsoever! 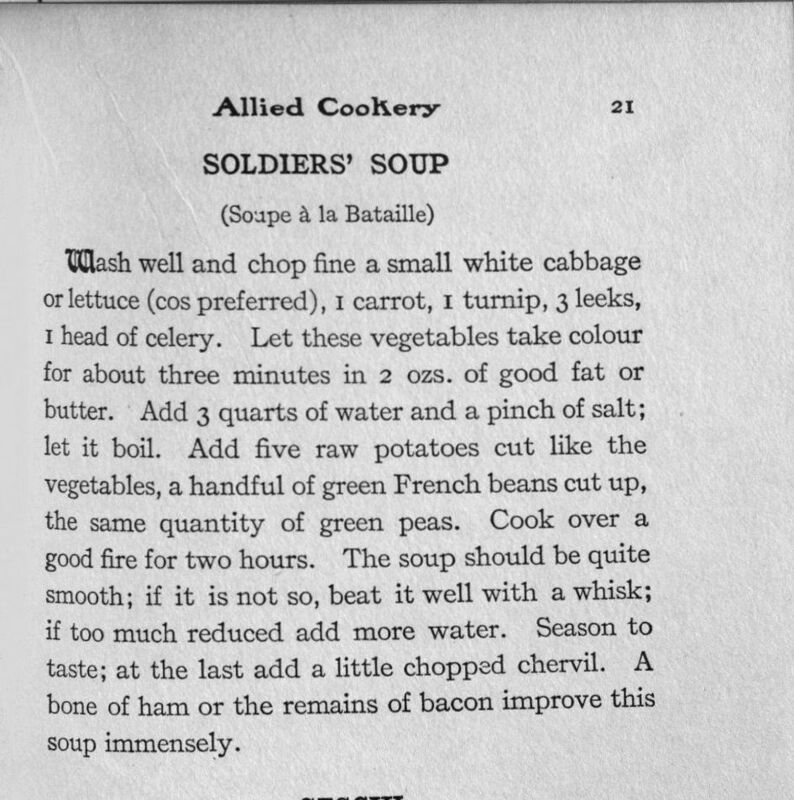 You can explore Allied Cookery in the Rubenstein Library or on the Internet Archive. Every Friday between now and Thanksgiving, we’ll be sharing a recipe from our collections that one of our staff members has found, prepared, and tasted. We’re excited to bring these recipes out of their archival boxes and into our kitchens (metaphorically, of course! ), and we hope you’ll find some historical inspiration for your own Thanksgiving. Post contributed by Elizabeth Dunn, Research Services Librarian.